The thing to understand about collectors is that we often love the hunt as much as the having. 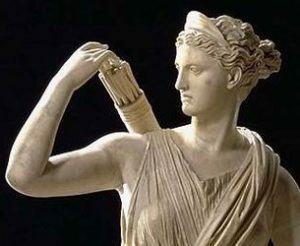 In the pantheon of ancient Greek gods, Athena would seem the likely favorite for those who love books. She was goddess of wisdom. And don’t get me wrong; I like Athena. But, I’m a book collector, so it is hard for me not to give a nod to Artemis. Because Artemis was goddess of the hunt. The gentle disquiet of relentless pursuit. The holding of knowledge and resources in a state of readiness. The certainty of the right target and moment. These little rituals of anticipation and finding connect us to the items we put on our shelves. That connection makes us better stewards of the objects we covet. Perhaps, on occasion, we even become a little part of the story our books will carry with them when they pass to other hands. As a bookseller, we get to share the hunt with you. We write today to share some favorite quarry. NIC. This is one of our favorite labels for a Churchill-related publication. The “C” means Cohen. Ronald I. Cohen. Ron literally wrote the book on Churchill’s published works. Nearly 25 years of exhaustive research went into his indispensable three-volume, 2,183 page Bibliography of the Writings of Sir Winston Churchill. 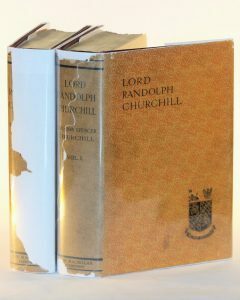 Ron’s Bibliography seeks to detail every single edition, issue, state, printing, and variant of every printed work authored by, or with a contribution from, Winston S. Churchill. So when we find something Not-In-Cohen we get excited. Excited like we’ve stumped the teacher, rescued something from the consuming entropy of history, and gotten a present all at once. Sometimes the object is a pamphlet or leaflet – an inherently ephemeral, fragile publication. 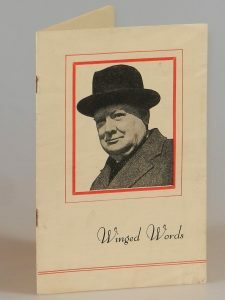 The Winged Words pamphlet we recently offered, a previously unknown wartime publication of Churchill’s speeches, is a great example. Sometimes it is a biggie, a major addition to the Churchill canon. Seven years ago, my friend, fellow collector, and Churchill Book Collector partner, Paul, emailed me an image of a book for sale. 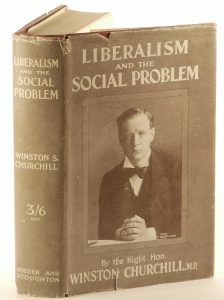 It was the front cover of Liberalism and the Social Problem – Churchill’s third published book of speeches (after Mr. Brodrick’s Army and For Free Trade) published in 1909. But this copy was a paperback – what we bibliophiles call a “wraps issue”. And it had the same striking half-tone photograph of the author found on the dust jacket of the hardcover first edition (only two substantially complete dust jackets are known to survive). I confess to an ALL CAPS reply to Paul: “BUY IT. NOW. FOR WHATEVER IT COSTS.” It turned out to be what I’d hoped – something totally unknown and potentially unique. 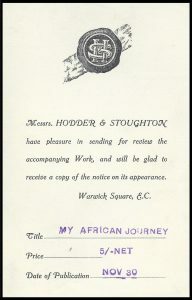 The publisher, Hodder & Stoughton, produced a wraps issue of My African Journey in 1908 (now extravagantly rare), but no wraps issue was known – or even presumed – for Liberalism and the Social Problem. Yet here it was, a publisher’s wraps issue of the second and final printing. Fittingly, it came to us from Glasgow. Scotland has a strong association with Churchill’s Liberal Party membership; during most of his time as a Liberal M.P., Churchill represented Dundee (1908 to 1922). It remains the only known surviving copy. Sometimes the opportunity isn’t so obvious. 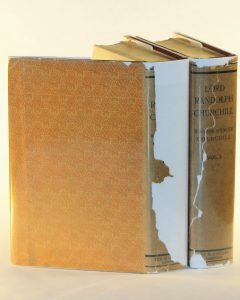 Dust jackets for any Churchill first edition prior to The World Crisis (1923-1931) are exceptionally rare. We’re talking perhaps less than a dozen jackets – total – known to survive for all of the first editions of Churchill’s early works spanning The Story of The Malakand Field Force through The People’s Rights. For some works, like Malakand, no dust jackets at all are known. 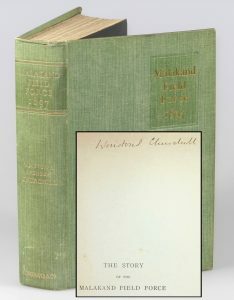 That was the case for the U.S. first edition of Lord Randolph Churchill until 2009. At the time, we had our eye on a particularly fine U.S. first edition set. We look at a lot of books, but I kept going back to the images of this particular set because the bindings were brighter than any I had ever seen. Eventually, I noticed something odd in one of the images – paper very slightly protruding from the top of the text block. I had a wildly optimistic hunch; could it be that the dust jackets had long protected the bindings, which would account for their brightness? And if so, might it possibly be that when the dust jackets had torn or worn, a previous owner laid them inside the books instead of throwing them away? So I asked. The good news: large portions of the original dust jackets were indeed safely tucked inside the books. The bad news: I had alerted the seller to their potential value. And this was an auction. And instead of just answering my question, the seller posted both my question and images of the jackets – a complete front flap, front face, and spine of one and a complete rear face and rear flap of another. My quiet inquiry sparked a bidding war which saw the price jump tenfold. Ouch. But another NIC was in the bag and previously unknown 1906 dust jackets were on the shelf. Sometimes the discovery is not an unknown edition or jacket, but just an unknown fact that an apparently humble book can yield. 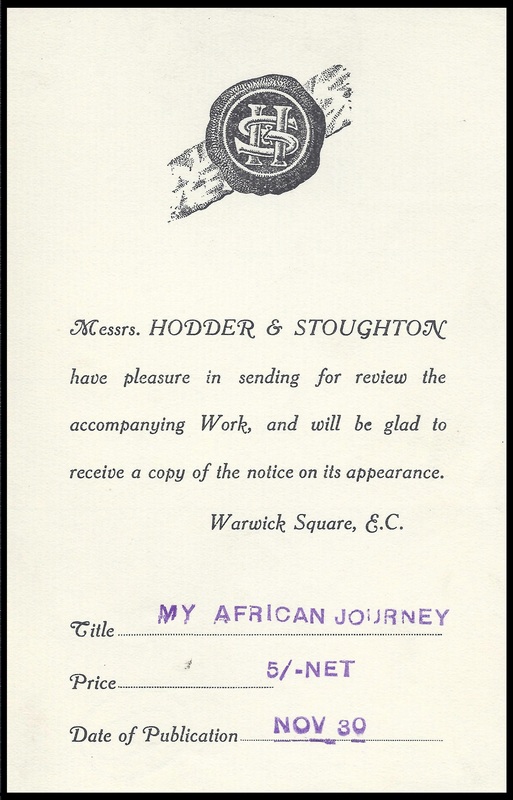 Bibliographers have long stated that My African Journey was published in December 1908. But a few years ago we found an otherwise unexceptional copy with the original publisher’s review slip laid in – a review slip that stated a publication date of 30 November. 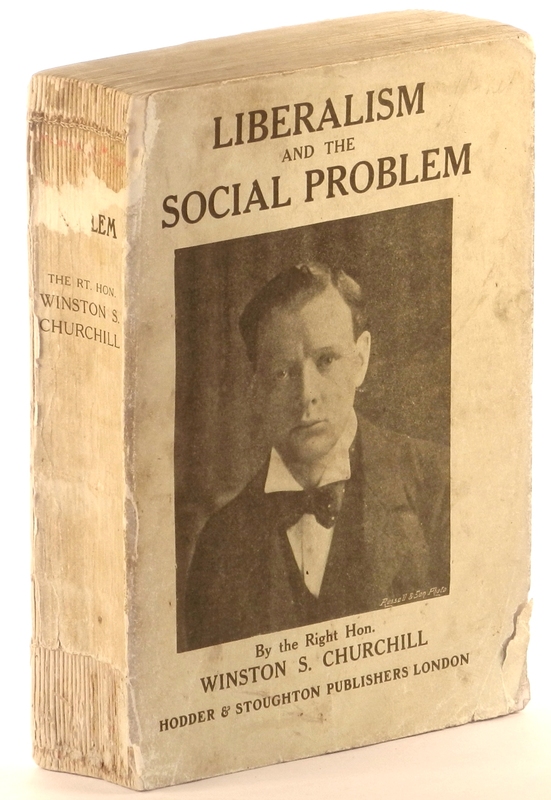 This means that it was published not only the preceding month, but on Churchill’s birthday. Maybe I’m crazy, but I sold my own spectacularly fine copy of My African Journey and kept the review copy instead. We buy and sell all over the globe – literally dozens of countries on five continents. Despite the fact that home and inventory reside in San Diego, precious few of our finds or customers are proximate to us. A few years ago, a San Diego customer approached us to sell a relatively modest collection of Churchill’s war speeches. He mentioned in passing that his father has some very early signed Churchill editions. Because of that cynicism, I almost flubbed it. I put off pursuing the matter, expecting it to be just one more proverbial goose chase. It was months before I heeded a reminder note to follow up with the customer and get in touch with his father. Honestly, I was not particularly diligent about the opportunity. It took still more months before we finally managed to connect. But we eventually did, and in the beachside home of this tremendously genteel fellow I was shown two remarkable items. 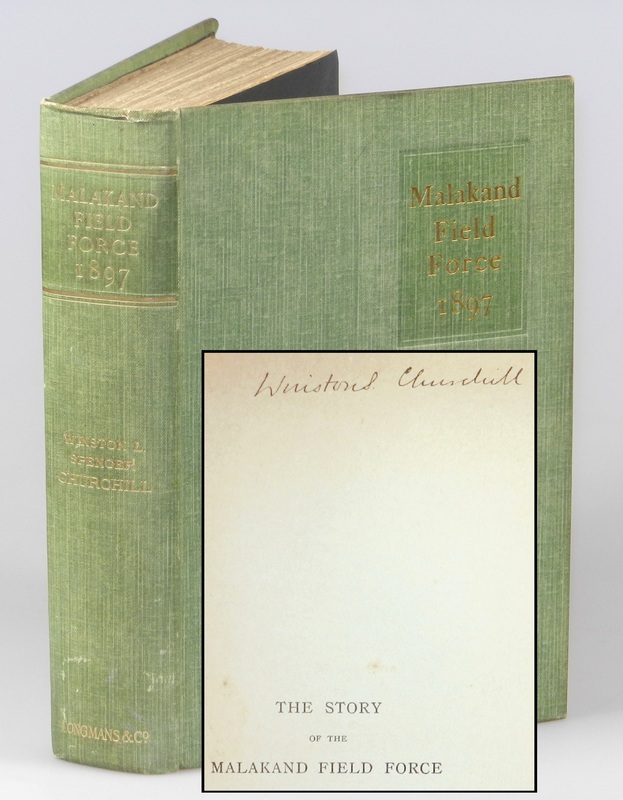 One was a spectacularly fine first printing, first state of Churchill’s first book, The Story of the Malakand Field Force. 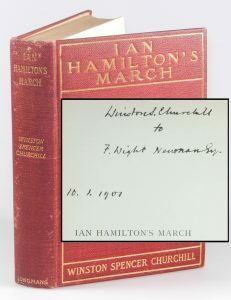 The second was the U.S. first edition of Ian Hamilton’s March (which you can read more about HERE). 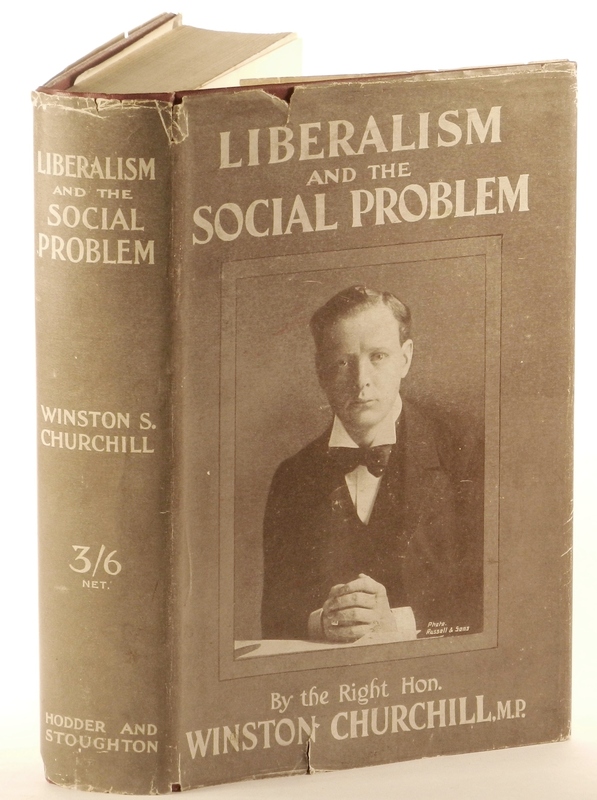 Both were signed by Churchill during his first lecture North American Lecture tour in December 1900/January 1901. And provenance was known for both, going all the way back to when the books were signed. I could search years for such books and not find them. These were sitting on a bookshelf not 10 miles from my library. What’s the point of these trophy stories? Respect the hunt! Master the arcane. Know the bibliographic detail of your subject better than anyone – or, more specifically, anyone else who might plausibly be hunting the same ground you are. Editions, printings, states, dust jackets, errata – all of it. And that’s just the books. Know the author, too. Where was the author at the time when this copy was allegedly signed and where and how did they typically sign? Know it all so that you know what you see when you see it and can act swiftly. Time. Spend it. And what better way to spend it than on a quest? Devote an unreasonable amount of time to both your mastery and your hunt. Obsess. Obsession just means you’re focused. Search. Diligently. Cleverly. Broadly. Intemperately. Relentlessly. Of course, if this sounds untenable, you have another option; find a suitably knowledgeable and compulsive bookseller to hunt with and for you.